James is the Community Justice Advisor. The Community Justice Scotland Advisor role is a cross team functional post that aims to ensure all work is fully aligned to Community Justice Scotland values and is community focused. The Advisor is responsible for increasing knowledge across the teams and advising on approaches to strategies, projects and priorities. The Community Justice Scotland Advisor will lead on community based lived experience events, along with a wide range of public speaking and engagement activity. Additionally, James is also a Development Officer within the Violence Reduction Unit. 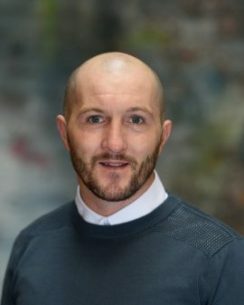 He has previously worked on various VRU projects Mentoring people with convictions seeking to re-create their lives and supporting change. James advocates strongly for change and awareness in how we address the hidden cost of untreated trauma and Adverse Childhood Experiences (ACE’s) in our society. Previously he has worked with a leading Children’s charity on diversion programmes with young people on the cusp of organised crime. James has both professional and personal experience of navigating the care and criminal justice system.